I have had an overdose of winter lately. Between the wild wind gush, the Siberian cold and the many snowfalls, winter is proving to be quite challenging this year. To increase my energy level, I have decided to try something different than my usual cup of coffee to wake me up in the morning. Indeed, as I was longing for something deliciously creamy, silky and frothy to help me get through the day, I have recently started making matcha green tea latte. 1. In large cup, whisk 1 teaspoon of matcha green tea powder with 1/2 cup of hot water (but not boiling, otherwise it will taste grassy, yikes!) until you see a small layer of froth appear on the surface. Set aside. 2. Froth 1/2 cup of almond milk (or soy milk) with a frothing wand or a milk frothing device. I like to use my Nespresso Aeroccino Plus, which works like magic. Pour the milk into the cup of water. 3. Add 1 teaspoon of honey, agave sirup or stevia to sweeten the tea. While this latte is good and comforting, it is also great to boost the metabolism, detoxify the body and to help the mind stay calm, yet alert. Also, by ingesting the chlorophyll-rich leaves instead of simply throwing away a tea bag once it's done steeping, the matcha tea provides more antioxidants than other types of tea. And it even contains 7 times more antioxidants than dark chocolate! That's plenty of reasons to be sipping this soothing latte. While this green mixture will not bring springtime any sooner, it is definitively helping me get my mojo back! What do you do to help you get through winter? I'd love to hear your tricks! 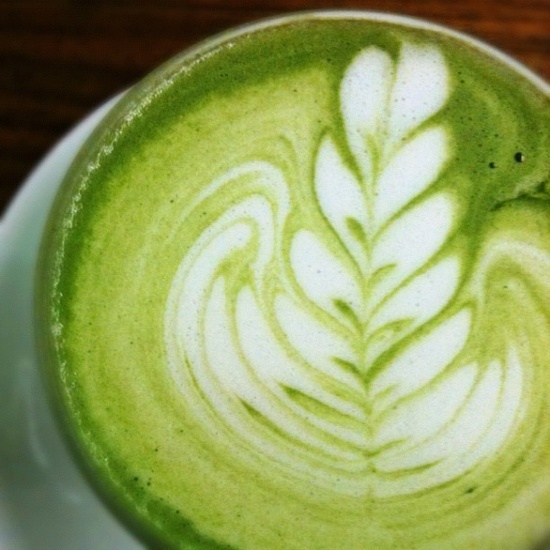 12 comments on "Matcha Green Tea Latte"
Oh wow, I never knew that you could drink matcha like this. I'll do a quick search to see where I can buy some matcha tea. BTW, thank you so much for the lovely comment you'd left. It's always gratifying to know that someone liked what I wrote (however odd my sense of humor can be!). I'm flattered and very touched by what you'd written. Thank you so much, Catherine for making my day. You should try it because it's so easy to do and it is delicious! Through the regular use of this matcha green tea, you get the chance to lose your weight.